Michigan High School Takes Video Systems All Digital | Visionary Solutions, Inc.
IPTV goes to school Michigan high school takes its video systems all digital by Wendy Ellis Though parting may still be sweet sorrow, no one at Pennfield, Michigan’s new high school misses the days when they had to search for an AV cart to show Romeo and Juliet. Whether it’s film or television in the classroom, or daily announcements in the cafeteria, everything travels in digital format over a single IP network. Gone are the days of tangled cables, damaged tapes and precious class time wasted wondering why there’s no sound coming from the system. “Now teachers simply log in from their classroom computer with their user name and password and do whatever they want to do,” says Instructional Technology Coordinator Tammy Maginity. “They can go into the digital library and search for what they want to watch or go directly to TV and pick a channel.” What may seem simple from the end user’s point of view is actually the result of a successful collaboration between an innovative Michigan software development firm and California manufacturer. Keeping it simple Jeff Ingle, President of Optimal Solutions, Inc. of Grand Rapids, Michigan, first began working on developing digital management software in the early 1990s, drawing on his background as a teacher and school information systems software trainer. “The problem back then was that there really weren’t any elegant tools available for an IP- video system,” says Ingle. “We had to wait for technology to catch up with our ideas –which it has.” He is referring specifically to the IPTV encoders from Visionary Solutions (VSI), headquartered near Santa Barbara, California, which has streamlined the process of digitizing analog signals for use on Internet Protocol (IP) networks. The encoders provide full screen, full resolution real-time video over IP from almost any source. At Pennfield, a cable TV feed is split into 16 channels at the network head end using standard cable boxes provided by the cable TV company. Optimal Solutions splits out each channel using an economical DVD/VCR tuner, then digitizes it with an AVN series encoder from VSI, which puts the digitized video onto the IP network. The 16 TV channels are available to network users together with the school’s digital phone service, security cameras and videoon- demand library. “What attracted me to the VSI encoder was that it offers a much lower-cost MPEG2 solution in comparison to other products out there,” says Ingle. “And it wasn’t a proprietary solution. Our eVideon™ application fits nicely with their technology.” The digitized video can be accessed through eVideon software anywhere there is a networked computer or a TV. Whether a teacher needs live streaming video, broadcast television or a stored digital media, eVideon provides an easy user interface that simplifies his or her task. At Pennfield High School, each classroom is equipped with a trio of desktop computers, a ceiling mounted Epson LCD projector, a wall screen, teacher tablet and document camera. Librarians are systematically digitizing all of the school’s DVDs and VHS tapes and storing them in files on the eVideon VoD server. “Digitizing older videos is not difficult to do, but it’s time consuming,” says Maginity. “Once you put the video into the front end, however, life becomes pretty easy. You don’t have to worry about teachers checking things out and not turning them back in. And they will always be there when someone else wants them.” Watching a video in one of the Pennfield High School classrooms Network administrator Susan Lewis sets up a video stream using eVideon The Cost Performance Leader in Professional IPTV The IPTV system is capable of encoding live video from cameras in the auditorium or from cameras on a portable distance learning cart that can stream or record a variety of events, from basketball games to visiting speakers. An encoder newly installed in the high school’s broadcast studio now allows live student newscasts throughout the building’s network and on the Web. In addition, the 16 TV channels on the IP network can easily be extended to other district schools. For areas where there is no computer access, Optimal Solutions equipped 25 32-inch Oleva LCD monitors (installed by Digital Age Technologies of Davison, MI) with an Amino set top box, which decodes the MPEG-2 stream back to video for input into the monitor. “We have monitors in the cafeteria, the fitness center, the hallways, the front office, the conference rooms, the band room, the choir room, the wrestling room—anywhere we do not have computers, “ says Pennfield’s Network Specialist Susan Lewis. “They can all be tuned to a different channel, to our announcements or to an on-demand source via handheld remote control or over the network.” High marks for IPTV “We’re seeing a convergence of voice, data and video technologies onto a single IP network,” says Brandon Julian, Director of Technology Design for Convergent Technology Partners, which designed Pennfield High School’s network. “We often recommend IPTV systems for our educational clients. The fact that the Internet is so widely used and carries so much media makes IP video formats ideal for a building-wide or district-wide media library, for streaming media on your local network, and for setting up video on demand systems. “There are cost benefits as well. Because IPTV runs on your data network, it eliminates the requirement to install coax cable systems or duplicate expensive head end equipment in each building. It can be utilized district-wide on the computers and infrastructure you already own, taking advantage of these previous investments.” Pennfield IT Director Tim Everett likes the flexibility offered by their IPTV-equipped network. “We own the system so we can choose and monitor the channels we want people to see. 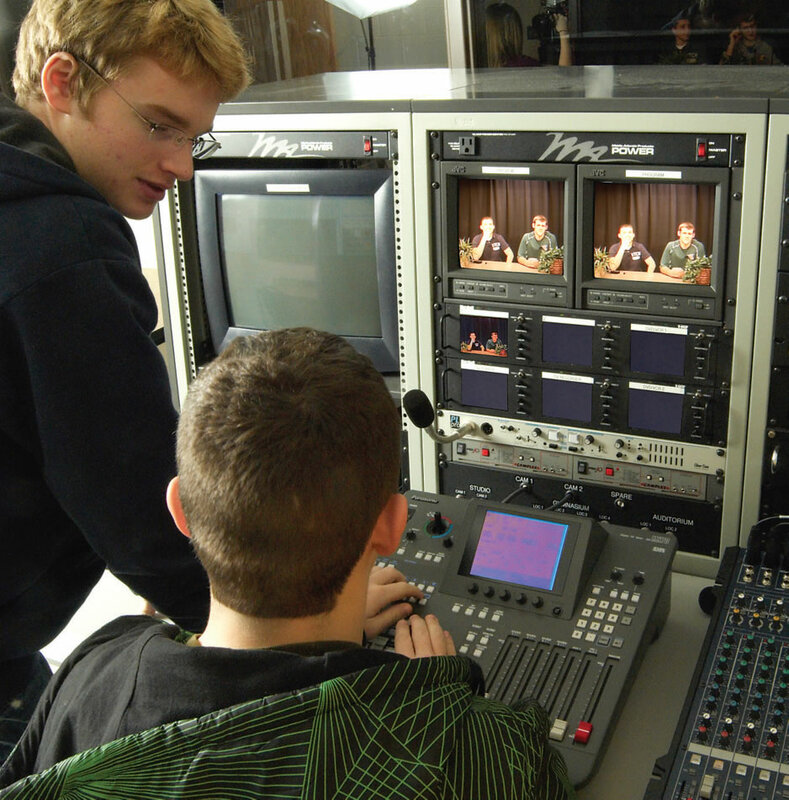 We can schedule programs building wide and eventually district wide.” If the district decides to change the channels they offer, it’s easy to reconfigure the tuners and the encoders simply respond. “This is my first opportunity to work with IPTV,” says Lewis. “I do like it and it’s easy to use. You have to configure it all to work together but once it’s done, it’s done. It’s not a daily chore and there’s very little maintenance.” Sharing ideas Ingle says that over 250 school districts and universities are currently using eVideon software to manage their digital media. “It’s a two-way, interactive video delivery system. They can record classroom presentations, labs, board meetings, school plays, and athletic contests. Anything they can record on video they can put on the system for live access and later retrieval.” Other K-12 schools, colleges and healthcare organizations use eVideon in different ways. The Grand Rapids Public Schools have already digitized and stored over 2,000 videos in its library. The Ottawa Area Intermediate School District has a multi-county service providing not only 400 streamed videos on demand, but delivery of over 9,000 physical assets, such as books, cameras and projectors, to over 100 schools in its system, allowing teachers to schedule delivery of equipment stored miles away.